Watch for insect damage and topdress your fields correctly! Insect damage seen in Adams County, WI, on July 2. Over the next couple weeks, it will be very important to keep an eye on your fields for insect damage and to topdress your fields with the correct recipe. With the increase in temperatures, we need to keep a closer eye on our crops for insect damage. 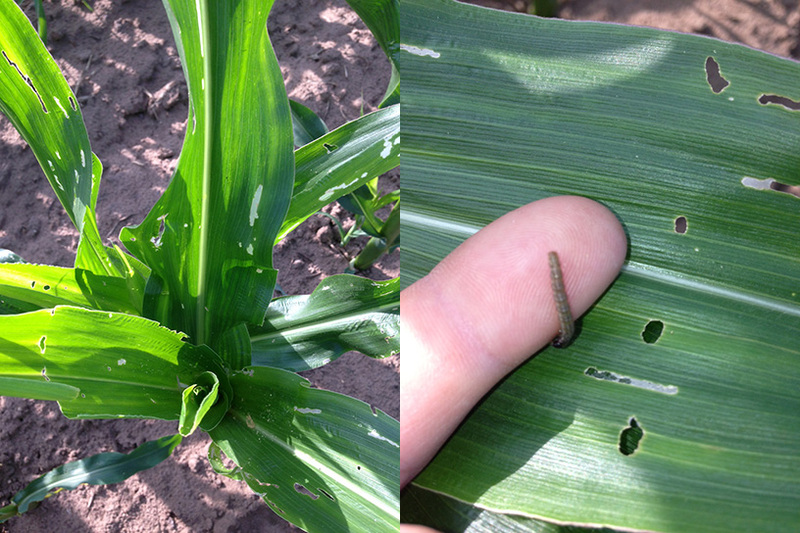 Yesterday one of our scouts, Bryan Decker, sent in some photos of some insect damage in northern Adams county. Also with the constant flushing of the soil profile we are encouraging growers to evaluate fertility shortfalls in their crop ASAP. When the need is established, a liquid or dry fertilizer recipe should be developed and applied to the field as soon as possible. A lot of our corn is at or past the V6 stage, when the number of rows around is established. We want to make sure that our corn has all it needs at this critical stage. Also in preparation for the rapid growth phase, V8 to VT, the plant is going to be taking up a lot of nutrients. Our agronomists have done a lot of tissue testing this past week and a lot of the samples are showing some deficiencies. The major nutrient deficiencies are Nitrogen, Potassium, and Sulfur. Some micros that have shown up as low have been Zinc, Manganese, and Boron. If you are topdressing your corn please make sure you are putting together the appropriate recipe for your fields. Contact one of our agronomists to assist you in this process. Thanks and have a safe Fourth of July! 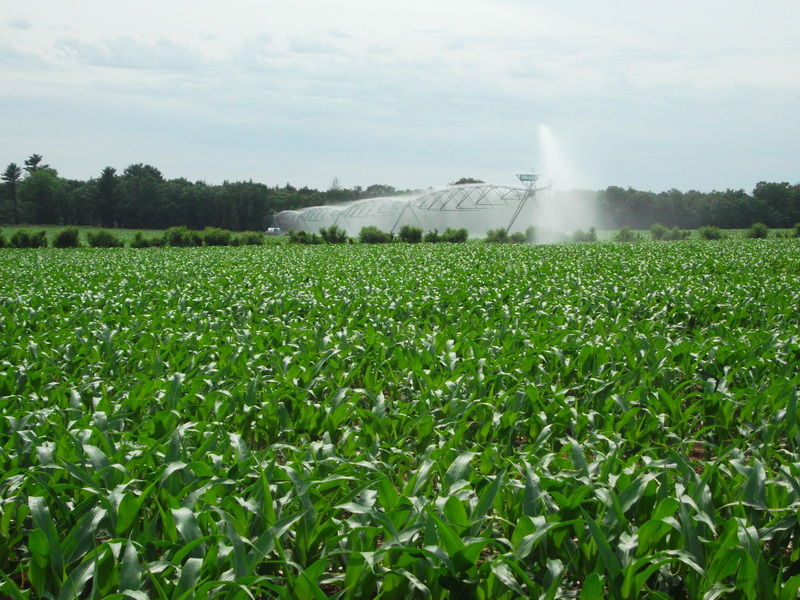 A lot of our irrigated fields are now receiving crop nutrients through the center pivot irrigation systems. Selecting the correct recipe is determined by many factors, crop present, yield goals, and plant tissue analysis. Pulling the tissue sample 3 to 4 days prior to fertigation is critical. This way the recipe can better reflect what the plants actually need at that stage. You can apply many things through your center pivots, such as Macro Nutrients (N, P, K), Secondary Nutrients (Ca, S), Micro-Nutrients (B, Mn, Zn, Cu, Fe) and plant hormones. Another option you can look at when fertigating is some of the products from Stoller. Two in particular to consider would be Bioforage and Stimulate. When you have shallow-rooted or poor root systems in general, an approved application of these two products can encourage a more aggressive root system. Please contact one of the agronomists at Allied Cooperative for further information on a recipe that is appropriate for your crop.